A computed axial tomography (CAT or CT) scan uses X-rays and a sophisticated computer to view specific details of the body's anatomy. However, unlike traditional X-ray where the radiation beam comes from a stationary source, a CAT scan is created by rotation of the X-ray beam in a circle around the patient to obtain a cross-sectional image. Additionally, multidector spiral CAT scans allow high-definition, 3-D imaging to permit greater visualization of blood vessels and internal tissues, such as those inside the chest cavity. Why Would I Need a CAT scan? CAT scans help physicians identify medical conditions, diseases or trauma. They are commonly done to detect fractures and internal damage in patients who have suffered injuries or to help diagnose patients with specific symptoms (e.g. abdominal pain). CAT scans can also rule out certain diseases, by showing the specific condition (e.g. a tumor) is not present in the patient. Conversely, these images may also be helpful in determining the next treatment step if a medical condition is known. Hence, CAT scan images frequently assist in the determination of the extent of a problem, surgical planning, guiding a needle to obtain a biopsy and assessing the effect of treatment. 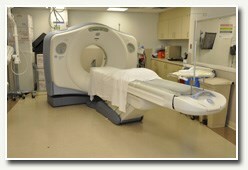 Patients do not experience any pain while undergoing a CAT scan. During the exam, patients lie on a table attached to the CAT scanner, which is a large doughnut-shaped machine. The table moves slowly, while images are taken of a specific part of the body. It is vital that patients lie still during the exam, so the images are as clear as possible. Once a patient enters the CAT scan room, the time that it takes to image the entire body is usually less than a minute. Depending on what body part requires imaging and the reason for the study, patients may be required to take an iodine dye (contrast medium) orally and/or by injection into a vein. Fasting may also be necessary. If oral or venous contrast is required, the preparation time before scanning can be half an hour or more. At Montefiore Medical Center, patients receive the most accurate diagnoses possible through the expertise of our board certified radiologists and state-of-the-art technology. Our facilities feature 12 multidetector CT scanners, including six GE LightSpeed 64-slice CT scanners, which move at an unprecedented coverage speed to capture incredibly clear images. This translates to increased patient comfort and convenience, as well as higher quality scans that can offer the most information.